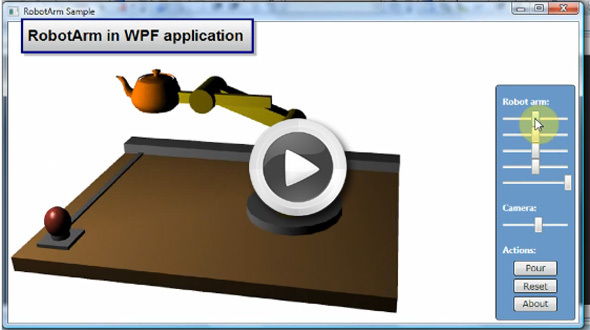 application and use them in your WPF application. 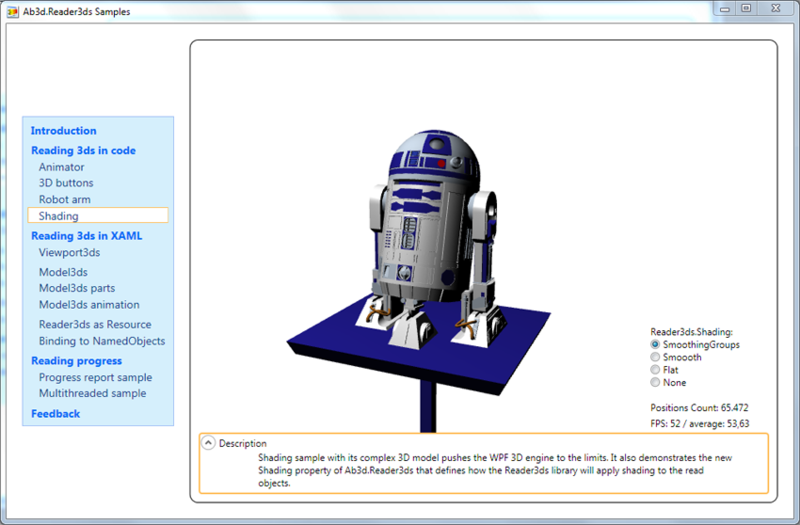 Ab3d.Reader3ds is a class library than can be used to read 3D models from 3ds files. It can be used in any WPF application. 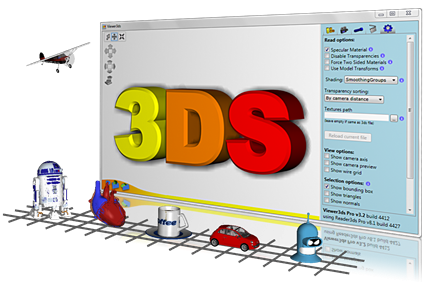 The 3ds file format is one of the most commonly used format for storing 3D models. 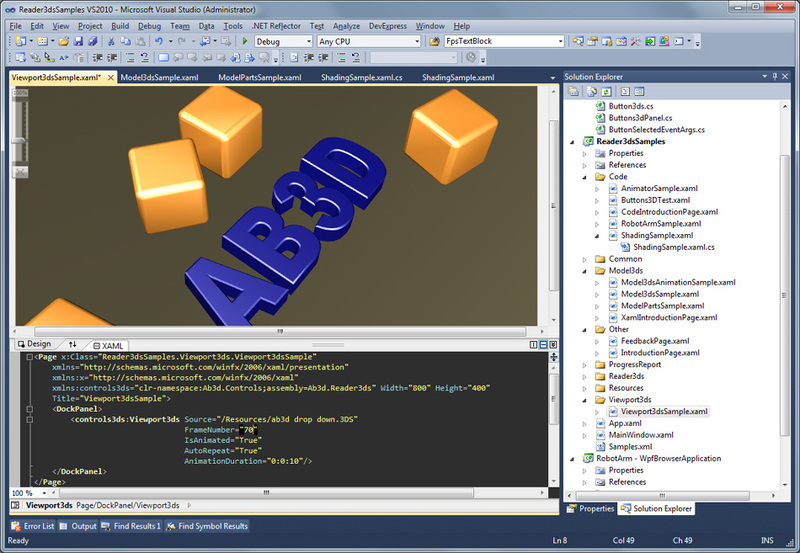 Therefore almost any 3D modeling application support exporting into it. The library is very easy to use. 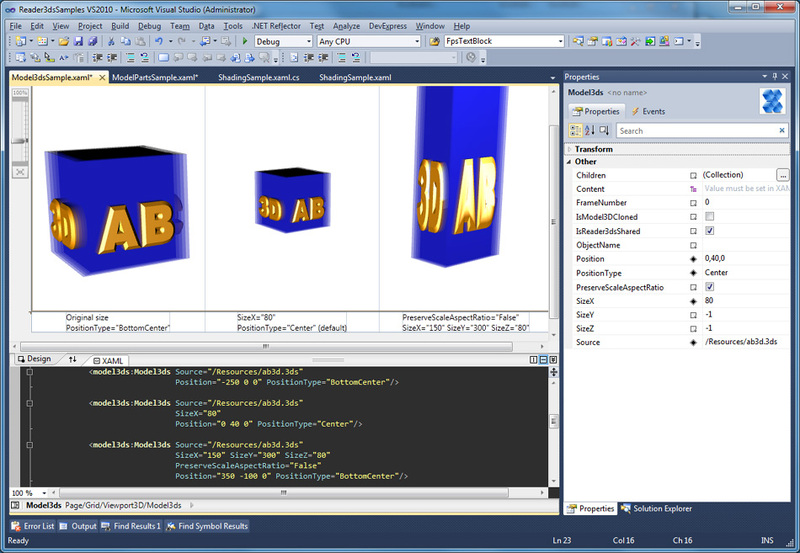 In XAML the 3D models can be shown with using Viewport3ds control or Model3ds Visual3D. For advanced usage the Reader3ds class can be used. It contains many properties and methods to control the reading of the 3ds file. The Reader3ds reads the model hierarchy and their names and makes it very easy to access the read models by their names. It contains the Transformer3ds class that simplifies transformations on the objects. There is also a Animator3ds helper class that makes playing animations stored in 3ds files very easy. The library comes with many samples that demonstrate its usage. Read Positions, TriangleIndices, TextureCoordinates and Normals. Read object hierarchy and object names. Read Smoothing Groups - data that define which edges are sharp and which are smooth. Read animations from keyframes data. Read all lights and cameras. Read solid color materials, texture materials and specular materials (specular materials are adjusted to be correctly displayed in WPF). Read multi-sub materials (breaks objects into more if one object contains more than one material). Get formated XAML with GetXaml method. 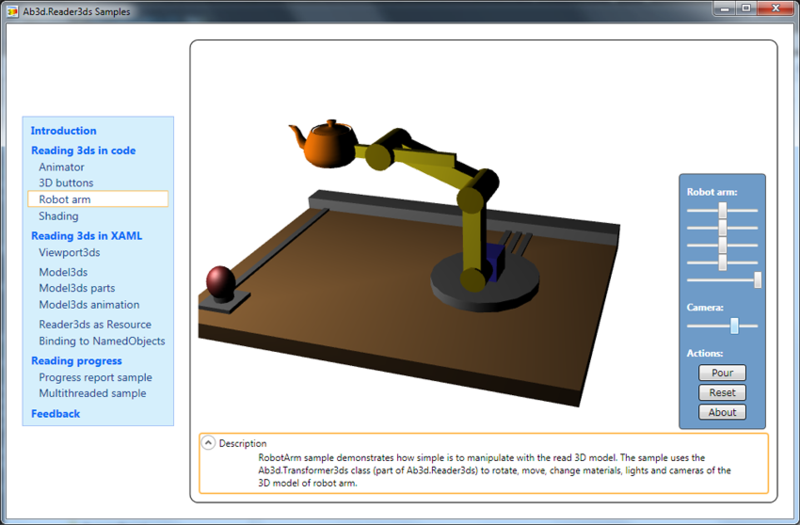 Simplified transforming of objects with Transformer3ds class. Simplified playing animations with Animator3ds class. Reporting progress while reading 3ds files. Tested with thousands of 3ds files. Can run in WPF Browser (partially trusted) applications. 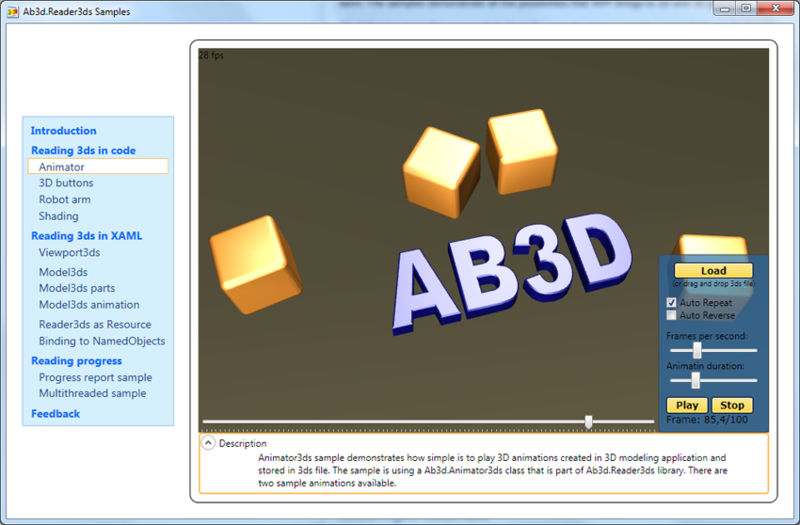 To see the development history of Ab3d.Reader3ds and Viewer3ds, check out the related blog posts. A complete list of Ab2d.Reader3ds versions can be seen here. Subscribe to RSS feed to all Blog posts. 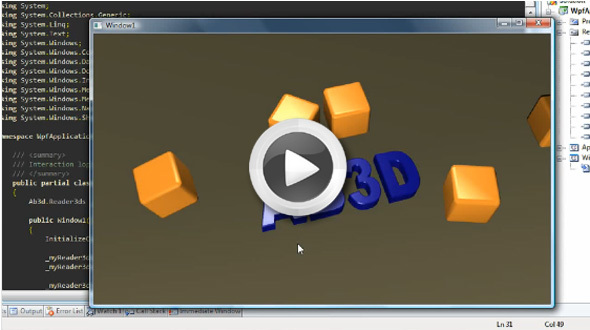 Subscribe to RSS feed to Blog posts related to Ab3d.Reader3ds and Viewer3ds. Subscribe to newsletter - enter your email into Newsletter box on my Blog.